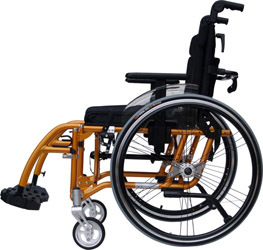 Unique frame design which gives the Excel G6 High Active Self Propelled Wheelchair the characteristics of a fixed frame sports chair whist still having a folding frame. Bakcrest height and angle adjustable, also fold down to help make chair ultra compact. Angle and depth adjustable brakes . The Excel G6 ‘High Active’ Wheelchair looks and performs like a fixed frame sports chair, but due to the unique Van Os Medical I-Frame, the chair is easy to transport with its folding frame. The backrest on the Excel G6 High Active Wheelchair will also fully fold down, making the chair even easier to transport, the backrest is also height and angle adjustable. This edition comes with the more ‘traditional’ swing away detachable footrests. The Excel G6 High Active Self Propelled Wheelchair Chair also comes with height adjustable armrests fitted as standard which can be easily removed with the push of a button. 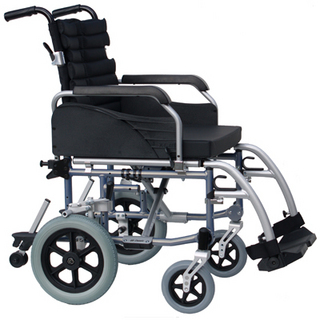 The wheel base of the Excel G6 High Active Wheelchair is adjustable to 6 different positions to allow the user to configure the chair just how they need the chair, as you would expect the rear wheels are fixed with quick release pins, so you can quickly remove the rear wheels when transporting the chair. The lightweight frame is available in 3 great colours including warm gold, silk silver and pearly black. like our Sports active wheelchair but with a folding frame for ease of transport, and comes in 3 unique colours.